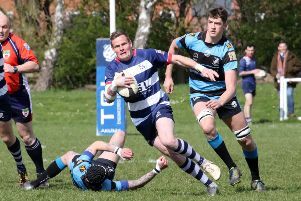 Banbury Bulls are back in the Wadworth 6X South West One East play-off race. Bulls ended back-to-back defeats with a hard-fought victory over second-placed Old Centralians on Saturday. Bulls emerged 17-14 victors at the DCS Stadium where they had to withstand almost constant pressure from the visitors in the second half. First half tries from Joe Winpenny and Tommy Gray, both converted by Ed Phillips, gave Bulls a 14-7 halftime lead with Joe Preece going over for the visitors and Shay Morgan adding the extras. Phillips kicked a penalty shortly after the restart before Centralians got on top. In their last home defeat by Marlborough, going down to 14 players cost Bulls in the end and they nearly paid the price again on Saturday when Sam Stoop and then Sam Carr-Archer both picked up yellow cards. The visitors pressure finally paid off when Michael Mathers burst through a gap with Morgan adding the extras. Gray got a yellow card in the closing stages as Bulls fought to keep Centralians out and this time they managed to see the game out.